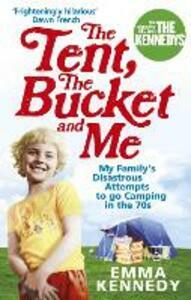 Emma Kennedy's hilarious memoir of wet and windy family trips, NOW ADAPTED FOR THE MAJOR BBC ONE SERIES THE KENNEDYS. For Emma Kennedy, and her mum and dad, disaster always came along for the ride no matter where they went. Whether it was being swept away by a force ten gale on the Welsh coast or suffering copious amounts of food poisoning on a brave trip to the south of France, family holidays always left them battered and bruised.